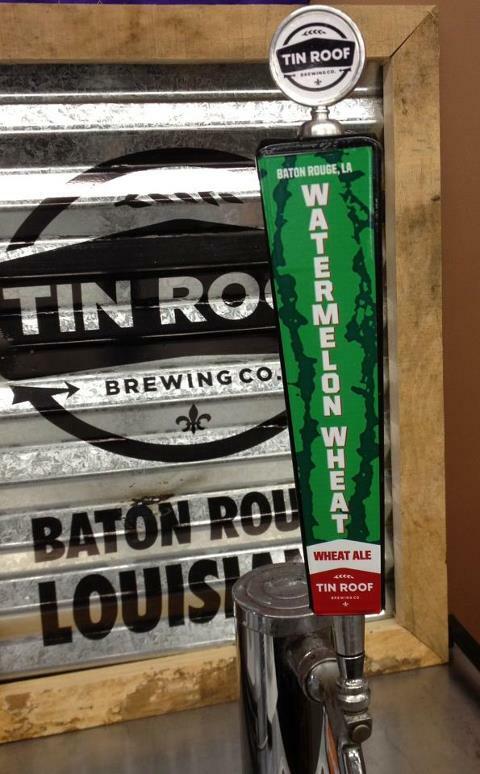 Tin Roof (Facebook - Twitter) rolled out their new seasonal brew - the Watermelon Wheat - yesterday evening at the Bulldog, so of course I had to go check it out. Mandi and I got there around 6 and holy crap, it was tough to even find a place to park. Apparently we were not the only ones interesting in checking out the new Tin Roof offering, not even close. After a short wait we had beers in hand (no thanks on the watermelon slices... don't fruit the beer) and it was time to taste. And there you have it... the beer is a slightly hazy deep golden color. Between the Tin Roof Blonde and their first two beers I think, with a decent bubbly white head. The aroma and taste both had hints of watermelon but it wasn't an overly sweet version of a fruit beer. I've always found that one of the biggest problems with fruit beers is they can end up too sweet and syrupy. No one wants to drink something that tastes like a Jolly Rancher. Well, let me rephrase that, no one who really appreciates beer wants one that tastes like a Jolly Rancher. Tin Roof avoided that, and created a very refreshing Summer beer that I'm sure I will enjoy again. Hopefully this is just the first of many tasty seasonal brews from Tin Roof, and I'll be looking forward to the next one. Well folks, the first seasonal from local brewers Tin Roof (facebook - twitter) is almost upon us. After some hype and anticipation the Baton Rouge release of the beer will be tomorrow (or maybe today by the time you read this? ), Wednesday May 30th at The Bulldog. I've been looking forward to something new from Tin Roof and the early reviews from the Avenue Pub's release have been positive regarding this new seasonal. So, if you're interested in trying a Watermelon Wheat beer... the Bulldog will be the place to be. Hello everyone! The WYES International Beer Tasting is coming up soon and I'm really excited to be a part of it with Brasseurs A La Maison. We will be there in full force with the tap canoe showing off another round of impressive homebrews. For those who were at the Zapp's Beer Festival you probably remember the tap canoe, and if you missed it, you don't have to wait a full year. We will be out on Saturday June 2nd, but there is also a Private Beer Sampling on June 1st that will feature a homebrew or two. Come on out to either date (or both!) and get your beer fix next weekend. I just wanted to share some pictures from our Baton Rouge beer geeks American Craft Beer Week beer tasting. Thanks to Brenton Day of TheAleRunner for hosting us, and everyone in attendance for bringing some awesome beers to try. Also much thanks to Brenton's wife for providing ample delicious snacks. Hey everyone, for those thinking about going to the WYES International Beer Tasting on June 2nd, or the Private Tasting the night before, the beer lineups for both events have been released! and of course... all the Homebrewers! I imagine I'll spend most of my time drinking the homebrews, just like at Zapp's in Baton Rouge. There are plenty of worthwhile commercial beers though, so if you want to try a bunch of local and regional beers all in one place, this is where you need to be June 2nd! Two Louisiana canned craft beer items to report this morning... first, I saw this at Bet-R yesterday and had to take a picture. Makes me smile to see local breweries Tin Roof and NOLA Brewing on the shelves. There were plenty of bottles as well of different Louisiana beers but it's cool to see the cans coming out. Especially in time for the Summer season and then football season. Secondly, congrats to NOLA Brewing, whose Brown Ale won a gold medal in the Ambers/Browns competition at the AmeriCAN Canned Craft Beer Festival! That's pretty cool, and at only 4%, this is a beer that can be enjoyed plenty at a day of tailgating or canoeing. Alright, time for another review, this time the Bell's Hopslam Ale... a beer I really wish was available in Baton Rouge but no such luck. Sometimes I try to avoid writing too much about beers we can't get in the Red Stick, but this one stuck out so much that I felt compelled to let everyone just how awesome this beer is. There, that's a little foreshadowing for you all, this is a good one so if you see it, buy it! Bell's Brewery (facebook - twitter) is probably best known for their Two-Hearted Ale, a superbly balanced IPA that is released year round and typically easy to find for those traveling to the Alabama or Florida beaches, or places like Atlanta for say, and SEC sporting event. The Hopslam is their double IPA, is released seasonally, and is much harder to track down unfortunately. Brenton of TheAleRunner was kind enough to hook me up with one, so here goes! I decided to go with a Delirium tulip glass for this one, which fit the 12 ounces of beer perfectly! It's a deep amber color with a finger so of white head. It has some really nice lacing as well as the head fades away. This beer looks exactly like what a DIPA should look like, not too dark, not too light, and well carbonated. The aroma is all hops... a bouquet of hoppiness with just a subtle hint of sweet malt and honey. It's definitely an IPA though, no hiding anything about that with the malt. The sweetness is a little more present at the front of each sip, before it gives way to a hop assault. It's still very balanced and absolutely delicious. It's slightly thin, but nothing bad there... good carbonation, hoppy bitter aftertaste but what else would you expect? Honestly... it's world class. There's a reason it's a 99 (or was at the time!) on BeerAdvocate... awesome DIPA. If you're traveling around in the Midwest or East coast and see some of these in bottles or on tap, try it. You won't regret it one bit... well, unless you don't like hops. The countdown is on... just 23 days until the WYES International Beer Tastings in New Orleans. This is one event I've heard about and read about on other beer blogs for a few years now but never been able to attend myself, but in 2012, that will change. I'll be there not only as a blogger, but also as a member of Brasseurs A La Maison serving up some homebrewed goodness. If you're looking for something to do June 2nd, make the short trip to New Orleans and try some new beers and some excellent homebrews! JOIN WYES, YOUR LOCAL PUBLIC BROADCASTING STATION, ALONG WITH LOCAL AND NATIONAL BEER DISTRIBUTORS FOR TWO DAYS OF BEER TASTING – AND WELL…JUST FOR A REAL GOOD TIME! On Saturday, June 2 from 6-9pm at the Lakefront Arena don’t miss the 29th annual WYES INT’L BEER TASTING! Guests will enjoy a quarter-mile of beer by sampling regional craft beers, ales and lagers. Be sure not to miss out on our beer seminars (short & sweet, but right to the point and informative). The Tap Canoe Returns At WYES International Beer Tasting! For those who made it out to the Zapp's International Beerfest in mid April you might remember the Brasseurs A La Maison tap canoe which stole the show. One of the fun things about Zapp's is that it's a not-for-profit event which allows homebrewers and up and coming breweries that aren't licensed yet to serve their beers in additional to all the commercial guys. I'll have another version of praline dubbel there, so I hope to see a lot of friendly beer loving faces! Side bonus to going to Pensacola for a bachelor party? Checking out new beer places! I recently ended up at Pensacola Beach to celebrate a friend about to tie the knot and while we were there my brother, Jay Ducote of Bite and Booze took a few hours to check out a few of the local beer hot-spots. After a quick cab ride we made it to the first stop of the afternoon, the Pensacola Bay Brewery. The brewery (facebook - twitter) is located in an older (or at least seemingly older) building near the water in downtown Pensacola proper. After paying the cabbie (cabs >>> DWI, folks!) we stepped in and found ourselves in a pretty cool bar/tasting room at the front of the brewery. There was some glass so we could see the brewing operation going on behind, and all the beers lined up on tap. The deal they had going was a 9-beer sampler for free if you bought a glass... um, sounds good to me! The sampler came with 9 of their standard-run beers, and as typical of any sampler we started off the tasting going light to dark. Up first were the DeLuna Extra Pale Ale, 1845 Pilsner, and the Sawgrass Wheat. All were decent beers but none stood out as extraordinary for the style, in my opinion. The 4th beer on the sampler was Pensacola Bay's ESB, and this was a really good beer. It was exactly what you would want from an ESB and definitely a step above the first three beers. The Riptide Amber and Banyan Brown followed... both solid beers but not quite as good as the ESB. Following the Banyan Brown it was time for the Lighthouse Porter, which had been recommended before and was a two-time gold medal winner at the Florida Brewfest. This one lived up to the hype, a very good porter! And it was followed by another winner, the Li'l Napoleon IPA. A very nice hoppy 70 IBU IPA with a respectable 6.7% abv. Up last on the tasting was the Conquistador Doppelbock, 8.1% and lightly hopped. Unfortunately the doppelbock disappointed me, just not enough roasted malt character and rich tones to this one. Oh well... can't win them all. After the tasting Jay and I each had a sample of the Blackbeard Stout on nitro, which was right up there with the porter, IPA and ESB as winners of the day. One day I hope Louisiana breweries will be able to have a bar in the front to serve their beers directly to customers, it was really cool to drink them straight from the source with the brewing operation in the background. As typical with a lot of smaller breweries, Pensacola Bay's brews were only available on tap (or growler from the brewery!) so if you find yourself in Pensacola and see them listed, it's worth giving them a try!